Pictures of Spiders Massive collection featuring pictures of spiders to help you identify your creepy crawler! If you have found a spider and would like to know what kind you have, flip through our pictures to see if there is a match. We believe this is the largest collection on the internet today! I just added the new slider and plan on adding detail to each photo as time permits, but until then, refer to the title to learn more about the spider being viewed. This spider looks pretty scary doesn’t it? It’s found in the desert and believe it or not, it will follow you – however, it’s not really following you, it’s seeking the shade of your shadow and it is not venomous. 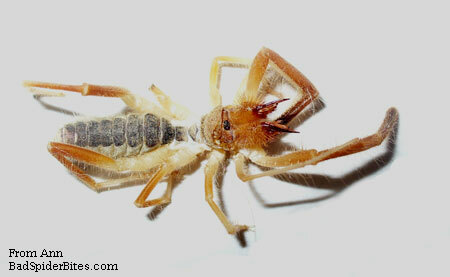 It’s called a camel spider. Did you find a spider and need to identify it? If so, upload your picture and we’ll have a look. It is Very important to let us know where you found the spider, such as location (state, etc). Most spiders will not harm you, however, a brown recluse can do an incredible amount of damage – most of the shocking pictures found on this site were caused by a brown recluse bite! The “violin” or “fiddleback” shape everyone warns about is in fact, hard to find and most often doesn’t look like a violin or fiddle at all; the claim that it is only located in certain region is also wrong, as proven by the many comments left on this website. Brown recluses and less than 1% of all spiders, have 6 eyes in 3 pairs with one of those pairs located in the center.